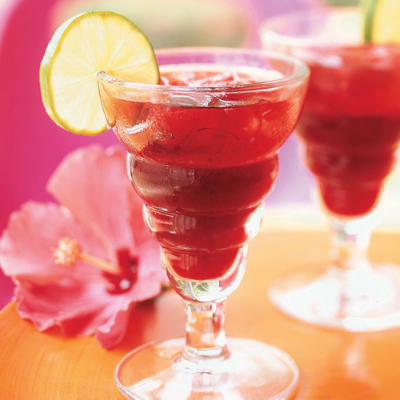 Jamaica flower iced tea is prepared from a flower called Jamaica (hibiscus sabdariffa) and its very popular here in Mexico. 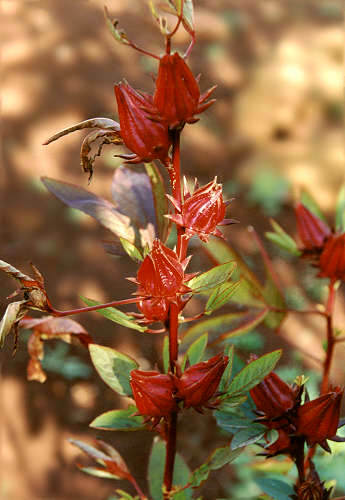 It is said that this flower arrived to Acapulco on the ships coming from India as part of the trade of products between the Nueva España and Asia. In Egypt, this flower is called “karkade”. Their custom is to drink karkade cold, but during winter they prefer it as a hot drink, and its used in some places or hotels to give a good welcome to the visitors. This plant is a bush, and sometimes reach 9 or 10 feet tall. It is cultivated mainly around June, the first flowers blossom during November, and finally the flowers are harvested during December and January. 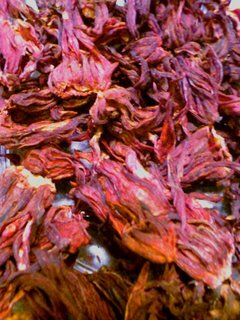 Once you get the flowers, they are dried under the sun for about 3 or 4 days, time in which the flower can be packed and distributed. Some of the benefits of this Jamaica flower tea can be listed as diuretic, laxative, digestive, but also can be used to stabilize high blood pressure and artery and kidney purifier. First, wash the flowers with water until you see that water comes out clean. In a deep bowl, put 3 cups of water and the cup of Jamaica flower and bring to a boil. Leave it boiling for about 15 – 20 minutes. After that, take it off the fire and add the 2 other cups of water. Let it cool down for a while and with a strainer (to separate the flowers and the tea), pour the water into a jar. Add the ice cubes that you consider appropriate and sugar to taste. Enjoy! This entry is filed under Drinks, Traditional Beverages. You can follow any responses to this entry through the RSS 2.0 feed. You can leave a response, or trackback from your own site. What is the taste like w/o adding the sugar? btw, i’ve added your blog into my reading list.